We know fall is here by the cooler weather streaming in and by the red, yellow, and gold hues that show up in the landscape. At our house, we also know it is fall when the stars appear in certain “spots” in the sky. 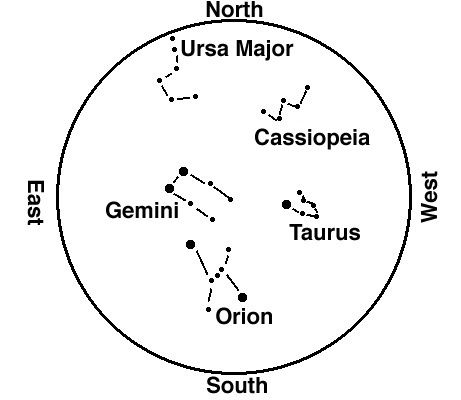 For example, each September, someone first notices that the constellation Orion is suddenly standing stately to the right of our cul-de-sac – and this group of stars- that we have come to be quite familiar with – is standing right there to the right, almost feeling within arm’s reach! We usually take a deep breath of the crisp evening air – and welcome fall, now that it is here. ~It actually helps to learn about constellations indoors first – just to get an idea of how we “connect dots” and fill in the pictures with mental images. ~To learn to see constellations we study shapes and also the relative size. Then , there are certain starter constellations, which once learned, will help you find additional ones (I cannot recall which ones are starter – sorry, but I am sure you can find them). And when learning to locate Orion, start by identifying the BELT! ~Star brightness is defined by magnitude and brighter stars (visible to the naked eye) have a smaller number: brightest stars have first magnitude (m=1) and faintest stars are sixth magnitude (m=6). 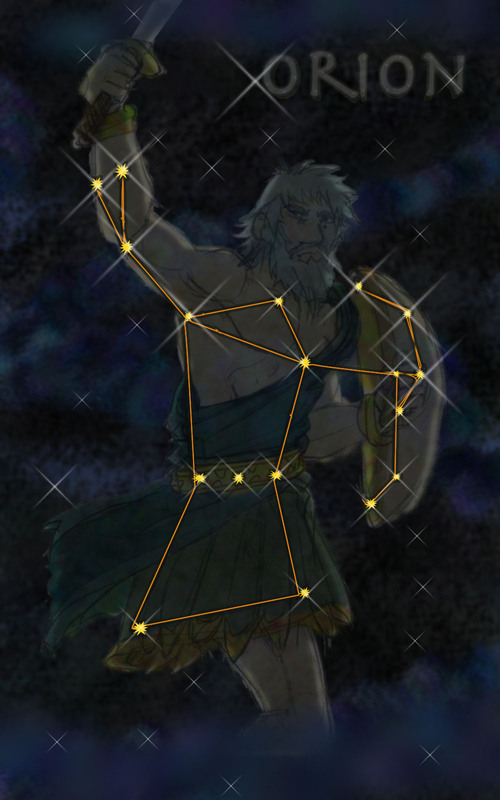 ~Most ancient cultures saw pictures in the stars of the night sky – talk about the different stories – especially note some of the ancient Greek and Roman myths that are connected to the stars! ~Pause to teach tidbits here and there. For example, one of our favorite shows is Monk, a comedy-drama detective TV series that ran from 2002-2009 (even though I only became a fan in 2010!! – but this show is a Priohouse Fav for sure!) In the episode Mr. Monk Goes Home Again, one of the clues that helps solve a crime was when Monk recalled a specific pigeon by the pattern on the bird’s back! Monk says, “I remember it had five little brown spots on its back because I remember thinking that it reminded me of the constellation Cassiopeia.” Well of course I made sure we talked about this – and noted the “W” shape of Cassiopeia! So do not miss out on small teaching opportunities in daily life- do not force them, but stay alert for on-the-spot teaching moments. Also, as noted with Whitman’s poem – in the midst of all this teaching- take time to just BE – time to enjoy soak up what you see. ~When you use charts to study constellations, be sure to also mark where the brighter planets are so they are not confused with stars! ~ Use flash cards to highlight certain factoids, like there are 88 constellations (or regions) of stars; asterisms are subsets – like the Little Dipper and Orion’s belt; Crux is the brightest constellation; Hydra has the most stars; and circumpolar stars are visible all night – for the entire year – depending on different Earth latitudes. I also mention animals in the zodiac belt, but prefer to stay away from astrology (and usually explain why).